News: LUCA BRASI TOUR SOLD OUT! 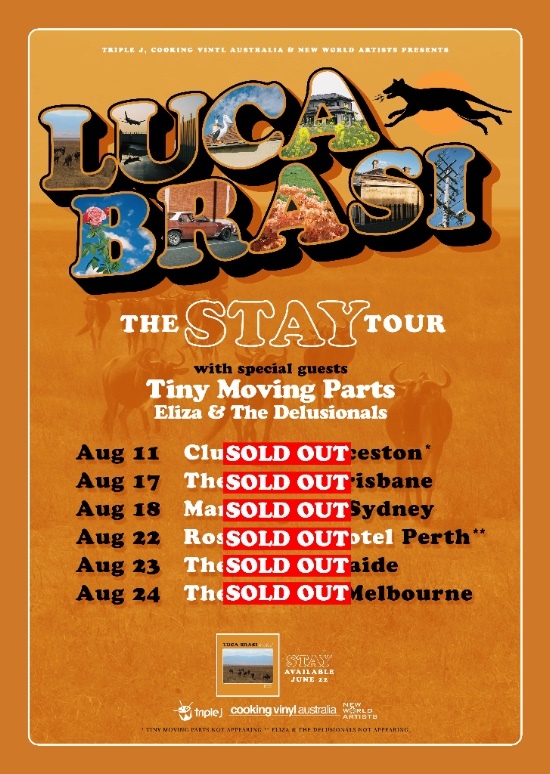 Tonight Luca Brasi celebrate a completely sold out tour at The Croxton in Melbourne, after sold out shows in Launceston, Brisbane, Sydney, Perth and Adelaide. The band have been around the country in support of their latest album, Stay, out now on Cooking Vinyl. Next chance to see Luca Brasi play live is Friday August 31st at the triple j One Night Stand after party in St Helens, Tasmania or the recently announced November 24th show at Brisbane’s Riverstage with Gang of Youths. Sat 11 August – Club 54, Launceston * – SOLD OUT! Fri 17 August – The Triffid, Brisbane – SOLD OUT! Sat 18 August – Manning Bar, Sydney – SOLD OUT! Wed 22 August – Rosemount Hotel, Perth ** – SOLD OUT! Thur 23 August – The Gov, Adelaide – SOLD OUT! Fri 24 August – The Croxton, Melbourne – SOLD OUT!